I haven't had the chance to write about my NYC experience yet so I said I'd do up a short but photo-heavy post about our short stop in Albany. Capitol building. Classical/Romanesque style. Ostentatious is a word I might use here. Too late. Holy hot-dogs batman, Albany is hiding some interesting architecture. I love brutalist architecture, but I also understand that it's not to everyone's taste. Everybody seems to have an opinion on architecture. Maybe it's because everybody who lives and works near "unusual" buildings is affected by their presence. Buildings do, after all, affect ones mood and behavior. And, in my opinion, modernist architecture is the Marmite of the built world. You'll either appreciate the minimalism or feel oppressed by these concrete monoliths. In short, some building cause controversy (duh). I won't get into it here, but almost all the buildings in this post have caused some form of controversy. Oh my God, I feel oppressed. While driving down from Lake Placid to NYC my parents and I stopped off at Albany for a bite to eat and a walk around. It was very much a spur of the moment stop so I hadn't done any research on the town. Boy was I surprised by what I found. 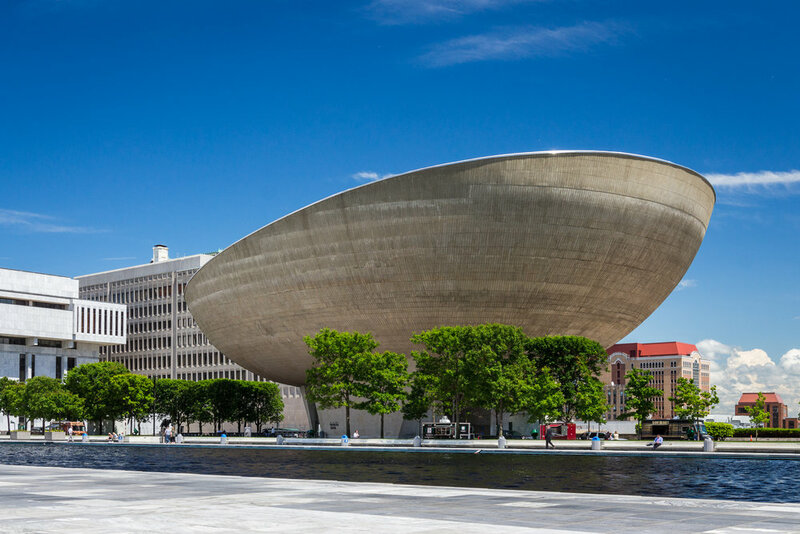 Some of you reading this will probably know that Albany is the capital of NY State and thus is home to the New York State Capitol which house the NY State Legislator and the Governor's Office, while off to one side of the Capitol building you will find the Empire State Plaza which include some State Agency buildings as well as a performing arts theater known as The Egg. Oh, and least I forget there's the System Administration Building of the State University of New York, which has more than a hint of Hogwarts off it despite it's rather dull name and apparent purpose. Quidditch, anyone? .....System Administration Building. Yeah, sure. Union General, Philip Sheridan, in front of The Capitol building. The Art-Deco, James T. Foley Courthouse. State Plaza with the Cultural Education Center at the end. Dad strutting his stuff in front of the Justice Building. The Egg. Laid out in all it's rounded glory. Moderist, Art Deco and Classical/Romanesque. Albany, you crazy. Thanks for reading. Okay, my next post will definitely feature me being mugged in NYC, along with photos.....of the city, not of me being mugged but that would be cool.